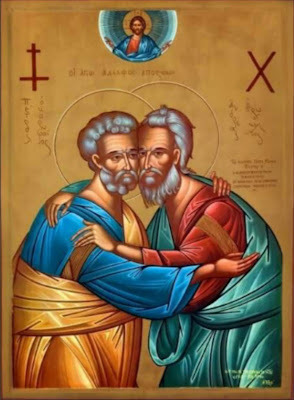 In the classic icon, we see the two brothers embrace: Saint Peter and Saint Andrew. It is an especially meaningful embrace that represents for us today a hope for the healing of some very old wounds. Today, especially, we pray for unity between Christians East and West. St. Andrew "the First-called" is greatly venerated in the East, especially by the see of Constantinople, which traces its origin to him. Since Andrew was Peter's brother, and the one who "introduced" him to Jesus, undoubtedly he prays for full unity among all who bear apostolic succession, in communion with the successors of Peter in Rome. Let us therefore also pray for unity, on this special day for churches West and East, Latin Catholic, Byzantine Catholic, and Orthodox. Catholic Christians know that the successor of St Peter is specially entrusted with the ministry of unity of all the churches. But we want other Christians to understand that the Pope is only a minister. He represents Christ as the chief shepherd of the whole flock, and he is given the responsibility and the capacity to carry out this ministry. But he does not replace Christ or substitute himself, as though Christ was somehow "separated" from the Church after his Ascension, and the Pope considered himself to be another Divinely appointed authority, with some sort of weird power independent of Christ. The Pope is a "vicar" (i.e. representative) of Christ whose ministry to "represent" the primacy of Christ extends properly to the whole Church. His office doesn't subtract from the authority of the other bishops in their particular churches; on the contrary he is called to strengthen and confirm his brother bishops in faith and communion. The Universal Church remains under the headship of Jesus Christ himself, present and active in the power of his glorified humanity, in the giving of the Holy Spirit, in the sacraments, in the immense outpouring of graces of every kind that guide and gently transform our lives and that also work secretly in the heart of every person to draw them closer to him, and also through the ecclesial ministry of the Pope and the bishops in union with him—flawed, weak, sinful human beings who nevertheless are called to this particular service for the good of all. Note: For the East, "Theologian" does not refer to just any blockhead like me who happens to have studied and taught and written stuff about Christian doctrine and ideas. A "Theologian" is someone with a profound knowledge of God that is founded on the special supernatural illumination and grace of the Holy Spirit. The term, as a "title" used in liturgical prayer, is reserved for a very few extraordinary figures. But we can all be "theologians," in the sense of living by the light of the Spirit and his gifts, and letting that light deepen our faith and understanding.